Crazy ants got the name "crazy" due to their erratic behavior. These ants have a way of wandering about areas aimlessly. They are dark brown in color and vary in size but their average size is about 1/10 inch long. 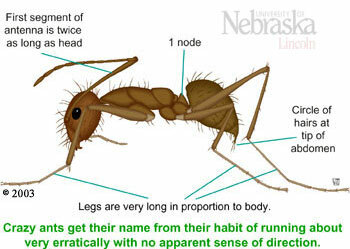 They have longer legs and antennae than other more common ants. Over time they have become more abundant in homes in the southern states (like Arizona) due to the fact that these states provide an ideal environment for them to survive and reproduce, unlike their kindred neighbors in the northern states where they are forced to survive with the help of other pests since they cannot survive cold temperatures. You will often find their nesting places to be cracks and voids of walls and also wander about buildings in search for food. They feed on grease, other insects, animal matter, and sweets. If you need more information or have a problem with any type of ants please call us and one of our professionals (ant pest control is their specialty) will answer any question you may have or send an ant exterminator to assist you. NOTE: We have some of the most qualified ant extermination professionals in the field and can be dispatched all over the State of Arizona although we are based in beautiful Scottsdale. Our website provides extensive tips and techniques to help you along the way, so don't forget to visit often and follow us on Facebook and Twitter, and of course sign up for our free e-Zine to learn more about our ant control services, natural ant control facts, and other pests information.